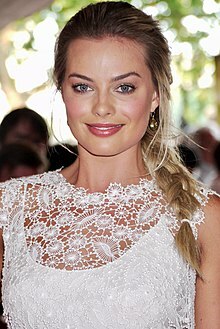 Margot Elise Robbie (/ˈmɑːrɡoʊ ˈrɒbi/ MAR-goh ROB-ee; born 2 July 1990) is an Australian actress and film producer. She has received nominations for an Academy Award and three BAFTA Awards. In 2017, Time magazine named her as one of the 100 most influential people in the world, and Forbes featured her on its 30 Under 30 list. In 2019, Robbie will portray actress Sharon Tate in Quentin Tarantino's crime drama Once Upon a Time in Hollywood, co-starring Leonardo DiCaprio and Brad Pitt. She will then reprise her role as Harley Quinn in various projects, including Birds of Prey (And the Fantabulous Emancipation of One Harley Quinn). She has also committed to star in and produce an adaptation of Matt Ruff's thriller novel Bad Monkeys, and to star as Maid Marian in an upcoming biopic. She will also feature in the independent film Dreamland, which she is co-producing, in Justin Kurzel's war thriller Ruin, and in a live-action Barbie film. Robbie will produce the drama thriller film Promising Young Woman via her LuckyChap Entertainment production company. ^ a b c "Happy Birthday Margot Robbie". Neighbours official site (Freemantle Media). 1 July 2008. Archived from the original on 2 September 2008. Retrieved 30 October 2008. ^ a b Marcus, Stephanie (13 May 2016). "We Can Prove Margot Robbie Isn't Lying About Her Age". HuffPost. Archived from the original on 14 May 2016. Retrieved 14 May 2016. ^ Finger, Bobby (16 May 2016). "After All That, Margot Robbie Is Definitely 25". Jezebel.com. Archived from the original on 17 May 2016. Retrieved 16 May 2016. ^ "Riz Ahmed cover star for Time magazine's 100 most influential". BBC News. 21 April 2017. Retrieved 22 April 2017. ^ Robehmed, Natalie (3 January 2017). "30 Under 30 Hollywood: Tyler Oakley, Margot Robbie, Evan Rachel Wood And The Class Of 2017". Forbes. Retrieved 21 February 2017. ^ Houghton, Jack (14 December 2014). "Homegrown Hollywood starlet Margot Robbie home on the Gold Coast for Christmas". Gold Coast Bulletin. Archived from the original on 23 December 2016. Retrieved 29 June 2016. ^ a b c d e Bilmes, Alex (1 March 2015). "Margot Robbie is Bazaar's April cover star". Harper's Bazaar. Archived from the original on 4 August 2015. Retrieved 16 April 2015. 'I'm officially off the market,' she confesses, confirming that she has a boyfriend: an Englishman, Tom Ackerley, an assistant director she befriended while shooting Suite Française in Belgium. ^ a b "Margot Robbie's Sad Family Secret". New Idea. Australia. 15 August 2016. Archived from the original on 19 December 2016. Retrieved 19 December 2016. CS1 maint: BOT: original-url status unknown (link) Additional on 19 December 2016. ^ Burke, Liz; Huxley, Jessica (25 June 2014). "Margot Robbie pays off her mother's entire mortgage for her 60th birthday". News.com.au. Archived from the original on 25 January 2016. Retrieved 6 July 2015. ^ Maresca, Rachel (10 July 2014). "Margot Robbie says she's not 'particularly attractive,' isn't the 'best-looking' among her friends". Daily News. New York City. Archived from the original on 5 March 2016. Retrieved 7 January 2015. ^ Kimmel Live, Jimmy. "Margot Robbie Interview". Jimmy Kimmel Live. Retrieved 11 December 2017 – via YouTube. ^ Miller, Katie (14 April 2009). "Margot Robbie still girl next door". Gold Coast. Australia. Archived from the original on 25 September 2009. Retrieved 6 March 2010. ^ "Laura Cameron Bio". American Broadcasting Company. Archived from the original on 26 September 2011. Retrieved 27 September 2011. ^ "Margot Robbie Interview". Vanity Fair. Retrieved 7 January 2018. ^ Stern, Marlow (3 March 2018). "Oscar Nominees' Most Embarrassing Roles: Gary Oldman's Dwarf, Timothee Chalamet's Evil Clown and More". The Daily Beast. Retrieved 19 January 2019. ^ "Margot Robbie". Neighbours.com.au. Network Ten. Archived from the original on 21 May 2009. Retrieved 19 June 2012. ^ "Donna Freedman". Holy Soap. Channel 5. Archived from the original on 30 June 2009. Retrieved 27 September 2010. ^ Kilkelly, Daniel (14 January 2010). "Neighbours star reveals audition shock". Digital Spy. Retrieved 2 March 2010. ^ Rowe, Darren (30 March 2009). "Smith, Ritchie score Gold Logie nominations". Digital Spy. Retrieved 17 April 2015. ^ "Kids, Vote for Margot!". Neighbours.com. Australia: Network Ten. Retrieved 6 March 2010. ^ Elferink, Birgitta (14 September 2010). "Margot Robbie quits!". TV Week. Ninemsn. Archived from the original on 27 October 2010. Retrieved 14 September 2010. ^ Yeap, Sue (3 April 2011). "Marais, Gibney to compete for Gold Logie". The West Australian. Archived from the original on 5 April 2011. Retrieved 6 April 2011. ^ a b Shearer, Geoff (15 September 2011). "Margot Robbie gets her US TV wings". Herald Sun. Retrieved 9 October 2011. ^ Andreeva, Nellie (10 February 2011). "'Law & Order: Criminal Intent' Gets New Captain, 'Pan Am' Gets First Stewardess". Deadline Hollywood. Mail.com Media. Retrieved 12 February 2011. ^ a b Bryne, Fiona (26 May 2012). "Margot Robbie still on high despite show's axing". Herald Sun. Retrieved 2 June 2012. ^ Rome, Emily. "Rachel McAdams rom-com 'About Time' gets new release date". Entertainment Weekly. Retrieved 11 April 2013. ^ "About Time (2013)". Rotten Tomatoes. ^ "About Time (2013)". Box Office Mojo. Retrieved 22 March 2015. ^ Blay, Zeba (19 June 2012). "'Pan Am' star Margot Robbie in talks for 'Wolf of Wall Street'". Digital Spy. Retrieved 19 June 2012. ^ Brevet, Brad (22 October 2013). "Scorsese's 'Wolf of Wall Street' Will Open on Christmas Day". Ropeofsilicon.com. Retrieved 22 October 2013. ^ "Box-Office Milestone: 'Wolf of Wall Street' Becomes Martin Scorsese's Top-Grossing Film". The Hollywood Reporter. Retrieved 3 August 2016. ^ "2014 Oscars: The nominees' list". CNN. 16 January 2014. Retrieved 22 March 2015. ^ Liebman, Lisa (2 July 2014). "The Best, and Worst, New York Accents on Film". Vanity Fair. Retrieved 4 July 2015. ^ Stone, Sasha (17 December 2013). "The Big Bad Wolf of Wall Street-Review". Awards Daily. Retrieved 20 March 2015. ^ Eames, Tom (6 March 2014). "American Hustle, Wolf of Wall Street lead MTV Movie Awards nominations". Digital Spy. Retrieved 6 March 2014. ^ Willis, Tania; Leyfield, James (30 March 2014). "'I've never won an award before': Margot Robbie stuns in scarlet red gown as she leads the winners at the Empire Film Awards". Daily Mail. Retrieved 30 March 2014. ^ McNary, Dave (14 September 2016). "Margot Robbie Signs First-Look Deal With Warner Bros". Variety. Retrieved 1 January 2018. ^ Kroll, Justin (15 July 2013). "'Wolf of Wall Street' Actress Margot Robbie Lands Female Lead Opposite Will Smith in 'Focus' (Exclusive)". Variety. Retrieved 16 July 2013. ^ "Focus". Rotten Tomatoes. Retrieved 16 March 2015. ^ Travers, Peter (26 February 2015). "Focus". Rolling Stone. Retrieved 22 March 2015. ^ "Focus (2015)". Box Office Mojo. Retrieved 22 April 2015. ^ Denham, Jess (7 January 2015). "Baftas 2015: Jack O'Connell, Margot Robbie and Shailene Woodley among rising star nominees". The Independent. Retrieved 7 January 2015. ^ a b Sneider, Jeff (18 January 2014). "'Wolf of Wall Street' Star Margot Robbie in Talks for 'Tarzan' – She's Jane (Exclusive)". The Wrap. Retrieved 21 January 2014. ^ Comers, Matilda (21 January 2014). "Margo Robbie scores female lead in Z for Zachariah". Australians in Film. Archived from the original on 2 February 2014. Retrieved 22 January 2014. ^ "Lionsgate/Roadside Team For Slamdance Horror 'Z for Zachariah'". Collider. 7 January 2015. Retrieved 7 January 2015. ^ "Z for Zachariah (2015)". Rotten Tomatoes. Retrieved 27 August 2015. ^ "Z for Zachariah". Metacritic. Retrieved 27 August 2015. ^ McWeeny, Drew (25 January 2015). "Margot Robbie shines in subtle end-of-world film 'Z for Zachariah'". HitFix. Retrieved 20 March 2015. ^ Knox, David (28 February 2015). "Airdate: Neighbours 30th: The Stars Reunite". TV Tonight. Retrieved 3 March 2015. ^ Rosser, Michael (27 June 2013). "Suite Francaise shoot begins". Screendaily. EMAP. Retrieved 2 July 2013. ^ "Suite Française". Rotten Tomatoes. Flixster. Retrieved 23 March 2015. ^ Smith, Nigel M. (13 November 2015). "The Big Short review: Ryan Gosling and Brad Pitt struggle to sell financial crisis". The Guardian. Retrieved 13 November 2015. ^ "Steve Peacocke lands Hollywood movie role alongside Margot Robbie". Woman's Day. 10 February 2015. Retrieved 10 February 2015. ^ Kit, Borys (22 October 2014). "Margot Robbie in Talks to Join Tina Fey in 'Taliban Shuffle'". The Hollywood Reporter. Retrieved 23 October 2014. ^ D'Alessandro, Anthony (11 February 2015). "Billy Bob Thornton, Alfred Molina & Sheila Vand Join Tina Fey Paramount Comedy". Deadline Hollywood. Retrieved 12 February 2015. ^ Sneider, Jeff (9 November 2015). "Tina Fey's Untitled Movie Based on 'Taliban Shuffle' Lands Release Date". TheWrap. Retrieved 10 November 2015. ^ Truitt, Brian (26 November 2015). "Sneak peek: Tina Fey goes to war in 'Whiskey Tango Foxtrot'". USA Today. Retrieved 27 November 2015. ^ Kroll, Justin (11 February 2014). "'Tarzan' to Swing Into Theaters July 1, 2016". Variety. Retrieved 11 February 2014. ^ "Will Smith, Tom Hardy and Margot Robbie eyed for Suicide Squad movie". Digital Spy. 16 October 2014. Retrieved 4 April 2015. ^ Sneider, Jeff (2 December 2014). "Will Smith, Tom Hardy, Jared Leto, Margot Robbie Set for 'Suicide Squad'". Retrieved 4 April 2015. ^ Foutch, Haleigh (13 April 2015). "Suicide Squad Begins Filming". Collider. Retrieved 14 April 2015. ^ Vlessing, Etan (1 December 2014). "David Ayer's Suicide Squad to Shoot in Toronto For Warner Bros". The Hollywood Reporter. Retrieved 20 March 2015. ^ Roshanian, Arya (22 September 2016). "Margot Robbie to Host 'Saturday Night Live' Season Premiere". Variety. Retrieved 23 September 2016. ^ Busch, Anita (1 June 2016). "'Larrikins' Sings With Aussie A-Listers For DreamWorks Animation". Deadline Hollywood. Retrieved 27 June 2016. ^ Waring, Olivia (6 March 2017). "Tim Minchin vows to get drunk with fans after Dreamworks cancels the film he's been working on for four years". Metro. Retrieved 6 March 2017. ^ Kroll, Justin (14 June 2016). "Margot Robbie Circling 'Goodbye Christopher Robin' Starring Domhnall Gleeson (Exclusive)". Variety. Retrieved 14 June 2016. ^ Alexander, Ella (28 September 2017). "Margot Robbie explains when is too young to be a child star". Harper's Bazaar. Retrieved 29 September 2017. ^ Robinson, Will (21 March 2016). "Margot Robbie cast as notorious ice skater Tonya Harding in I, Tonya". Entertainment Weekly. Retrieved 23 March 2016. ^ Kroll, Justin (14 June 2016). "Craig Gillespie to Direct Tonya Harding Biopic Starring Margot Robbie (Exclusive)". Variety. Retrieved 14 June 2016. ^ Burr, Ty (20 December 2017). "'I, Tonya' bedazzles". The Boston Globe. Retrieved 6 August 2018. ^ Barnes, Brooks (23 January 2018). "2018 Oscar Nominations: 'The Shape of Water' Leads With 13 Nominations". The New York Times. Retrieved 23 January 2018. ^ Joyce Eng. "Oscars: Margot Robbie ('I, Tonya') first to win for playing Olympian?". GoldDerby. Retrieved 10 February 2018. ^ a b Selleck, Emily; Simonot, Suzanne (19 December 2016). "Suicide Squad star Margot Robbie and director Tom Ackerley marry in secret ceremony in Byron Bay". Gold Coast Bulletin. Retrieved 20 December 2016. ^ McNary, Dave (12 February 2016). "Margot Robbie to Star in Noir Thriller 'Terminal'". Variety. Retrieved 19 February 2016. ^ Ide, Wendy (30 October 2018). "'Slaughterhouse Rulez': Review". Screen Daily. Retrieved 9 November 2018. ^ Kroll, Justin (21 April 2017). "Margot Robbie to Play Queen Elizabeth in 'Mary Queen of Scots' (Exclusive)". Variety. Retrieved 15 August 2017. ^ "Bafta Film Awards 2019: The nominations in full". BBC News. 9 January 2019. Retrieved 9 January 2019. ^ McDonald, Dani (16 March 2018). "Margot Robbie confirms she will play Sharon Tate in Quentin Tarantino movie". Stuff.co.nz. Retrieved 16 March 2018. ^ "Margot Robbie Reveals Full 'Birds of Prey' Title: 'The Fantabulous Emancipation of One Harley Quinn'". thehollywoodreporter. 20 November 2018. Retrieved 20 November 2018. ^ Kit, Borys (13 December 2016). "David Ayer, Margot Robbie Reteam for All-Female DC Villains Movie 'Gotham City Sirens' (Exclusive)". The Hollywood Reporter. ^ Kroll, Justin (11 January 2018). "'Suicide Squad 2': Michael De Luca Joins Charles Roven on Producer Team". Variety. Retrieved 17 April 2018. ^ Kit, Borys (23 August 2017). "'Crazy, Stupid Love' Filmmakers to Write, Direct Joker and Harley Quinn Movie (Exclusive)". The Hollywood Reporter. Retrieved 17 April 2018. ^ Dumaraog, Ana (15 January 2019). "Birds of Prey's Cassandra Cain Actress Says Filming Has Begun". Screen Rant. Retrieved 15 January 2019. ^ Fleming Jr, Mike (17 April 2018). "Cathy Yan Is Warner Bros' Choice To Direct Margot Robbie In Next Harley Quinn Film". Deadline Hollywood. Retrieved 17 April 2018. ^ Hipes, Patrick (20 July 2016). "Universal Options Matt Ruff Novel 'Bad Monkeys' With Margot Robbie To Star". Deadline Hollywood. Retrieved 21 July 2016. ^ Kay, Jeremy (6 March 2017). "Margot Robbie adventure 'Marian' lands at Sony". Screen International. Retrieved 7 March 2017. ^ Kroll, Justin (13 October 2017). "Margot Robbie's 'Dreamland' Casts Finn Cole, Travis Fimmel (Exclusive)". Variety. Retrieved 14 October 2017. ^ Wiseman, Andreas (5 September 2018). "Margot Robbie & Matthias Schoenaerts To Star In WWII Thriller 'Ruin' For Justin Kurzel & MadRiver". Deadline Hollywood. Retrieved 5 September 2018. ^ Kroll, Justin (8 January 2019). "Margot Robbie's 'Barbie' Film Moves Ahead as Warner Bros. Closes Deal With Mattel". Variety. Retrieved 9 January 2019. ^ N'Duka, Amanda (29 March 2019). "Bo Burnham To Star Opposite Carey Mulligan In 'Promising Young Woman'; Alison Brie, Connie Britton, Adam Brody & More Round Cast". Deadline Hollywood. Retrieved 29 March 2019. ^ Kirkpatrick, Emily (20 December 2015). "Margot Robbie's Wedding Venue and Dress Are a Bohemian Dream (Photos)". People. Archived from the original on 14 May 2017. Retrieved 14 May 2017. ^ Lamont, Tom (3 February 2018). "Margot Robbie: 'I asked my girlfriends what they'd been through. And they were angry'". The Guardian. Retrieved 3 February 2018. ^ Chandra, Jessica. "Who Is Tom Ackerley? What To Know About Margot Robbie's Reported Husband". Elle. ^ Rippon, Remy (4 May 2016). "Margot Robbie has a new job as the face of a major beauty brand". Vogue Australia. Retrieved 8 May 2016. ^ "Nissan signs actress Margot Robbie as electric vehicle ambassador". 21 February 2017. ^ De Klerk, Amy (16 March 2018). "Margot Robbie revealed to be the latest Chanel ambassador". Harper's Bazaar. Retrieved 16 March 2018.